Here's Sam Altman (see the picture above). CNN calls Altman "Silicon Valley's 28-year old whiz kid." Altman is the guy who is now in charge of that economic powerhouse Y-Combinator, the venture capital "accelerator" I mentioned in my posting yesterday. 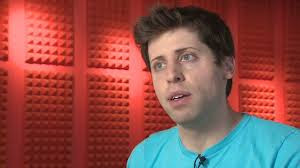 Sam Altman, the tech wunderkind profiled by Tad Friend, is quoted as saying, “Democracy only works in a growing economy. Without a return to economic growth, the democratic experiment will fail.” Doomsday prediction aside, democracy is a tool that people use to make decisions together. You can find democracy at your local PTA, at community meetings and block parties—wherever people are free to decide among themselves what happens next. To suggest that democracy relies on economic growth to exist is to forget that social change is created not by big companies backed by venture capitalists but by actual human beings. Thank you, Andrew Seeder! My sentiments exactly. I'm with "actual human beings!" This raises definitional questions. I know an extraordinarily kind, generous, and hardworking young man who improves the lives of everyone he meets. He has Down syndrome, and is categorized as disabled. I am SO glad that he is not a whiz kid.